We at 2 Dump It, LLC have a strong belief that renting a dumpster should be easy. So we strive to simplify the dumpster rental. St. Louis homeowners and contractors can rely on a smooth, straight-forward experience. Call and speak directly to an owner or dispatch employee. Direct communication means less hassle for you when you rent a dumpster in St. Louis, and nearby cities. For dumpster rental in St. Louis, Chesterfield, Fenton, Florissant and Clayton, don't settle for unresponsive or late garbage dumpster service. We consistently deliver our its roll off trash containers on time and pick up quickly upon your request. We offer daily, weekly, monthly and one-time service. We believe in offering our customers the lowest possible dumpster rental prices that still enable us to earn a fair profit for our dumpster service. St. Louis residents don't have to worry about hidden charges with 2 Dump It, LLC. We are known for our competitive rates and unbeatable service. Our dumpster prices include delivery, pickup, and disposal at the landfill, up to the specified weight allowances for your roll off trash dumpster. 10 yard dumpster for 48 hours costs $235 (includes 2000 lbs.). 2 Dump It, LLC has the following roll off trash dumpsters to choose from: 10 and 15 yard dumpsters. These trash containers are an ideal solution for cleaning out your basement, garage, or an entire house. Homeowners and contractors will find that 10 and 15 yard dumpsters are an economical choice for most construction debris removal projects as well. Roof tear off and replacement, remodeling projects, demolition work, and more can be accomplished with a temporary dumpster. 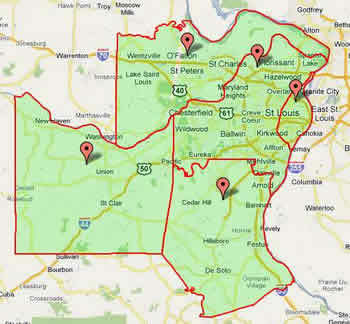 Call 2 Dump It, LLC of St. Louis today at (314) 561-7188 to rent roll off dumpsters in St. Louis County, Missouri. Call (314) 561-7188 Today for St. Louis Dumpster Rental Including Chesterfield, Fenton, Florissant, Clayton, Maryland Heights, Kirkwood, Ballwin, and Surrounding Cities.